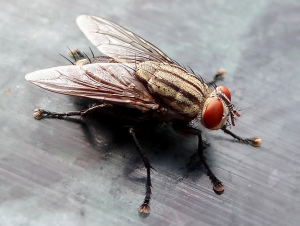 House flies are one of the most annoying pests – there is no doubt about that. One of the main reasons for this is that this fly is considered to be the most common among all of the domestic flies that are currently in existence. In fact, the house fly is said to account for up to 91% of all of the flies that are found within habitats that are common to humans. House flies are found in all regions, across the globe. These pests are not only a nuisance, but, they are known to carry potentially serious diseases. In this guide, you will learn many facts pertaining to house flies. Most house flies are easily recognizable. The thorax region of the insect is blue or black. There are, typically, four lines that run along the backside of the creatures. The body contains many projections that resemble hair. Female house flies are typically much larger than their male counterparts. The eyes of a fly are red. The female has a significantly larger space between their eyes than males. Interestingly enough, house flies only have one pair of wings. Other insects highly resemble these insects. Examples of these insects include the stable fly and the lesser house fly. According to studies, female house flies have the unique capability of laying right at about 500 eggs during the course of their lifetime. Each batch of eggs that are laid by the female fly includes anywhere from 75 to even 150 eggs. Within just 24 hours of laying the eggs, the larvae hatch. The larvae are called “maggots”. The infant flies thrive on organic matter. They measure up to 9mm in length and have no legs. They look like white or pale-colored worms. The maggots live in this stage for up to a day and a half. They then transition into pupae and become adult flies. In most cases, the adults live anywhere from two weeks to a month. Within a day and a half of becoming an adult, the female is ready to engage in the reproduction process.